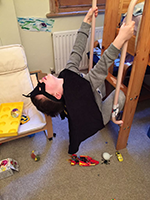 Pat dreamt of being a bat with amazing powers, just like the superheroes in his favourite comics. He made himself a special outfit, now all he needed to do was convince everyone he was.. SUPERBAT! The trouble was the superpowers he claimed to have (super hearing, flying, finding his way in the dark) all the other bats had too. His eyes didn’t shoot laser beams and he wasn’t extra strong like the superheroes in his favourite comics. Maybe he wasn’t destined to be a ‘superbat’, maybe he just looked… silly. Then one day something happened, help was needed and Pat didn’t hesitate, he was a true SUPERBAT and bravery was his superpower. 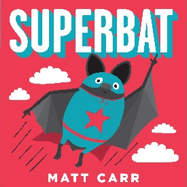 An appealing, attractively illustrated story with interesting facts about bats to discover along the way. This story is fun to read aloud, you can emphasise the bits in bold capitals just like super hero comics. Children will enjoy looking at the pictures and may want to pause to talk about them with you. 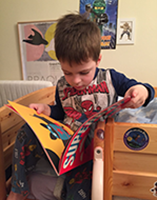 When you return to the book children may like to join in with some of the words such as ‘POW’, ‘WHAM’ and ‘SUPERBAT’ and perhaps with Superbat’s conversations with his friends eg ‘I have super hearing,’ boasted Pat… ‘SO DO WE!’ his friends screeched. How does Pat the bat feel at different parts of the story? Look back at illustrations and words for clues. Can children look crestfallen like Pat or brave and proud as he does at different points in the story? What did children find out about bats that was new or surprising? 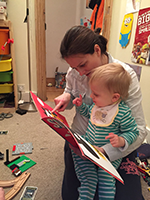 Does the story remind children of any other books, comics or cartoon films they know? Children could tell you the story perhaps using a finger puppet bat to help( see below). Maybe they could pretend to be Pat telling his version. What is it like to look at the world upside down? Try look underneath your legs and see what the world looks like. If you join in too this will be even more fun. Pat is a good name for a bat as it rhymes. How many other words can you find together which rhyme with bat? You could make a list. 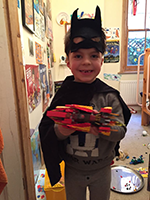 Children could design another outfit for SUPERBAT. Children could decorate their finger puppet and use it to retell the story. What other adventure might SUPERBAT have? Talk about this, maybe you could make up a story together. Children could create a comic strip of their story. 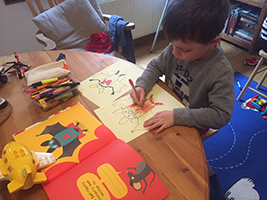 Make a ‘did you know?’ mini book about bats with a different fact on every page. Children can use the information in the book and you could look together at the links below for new information.